I am still getting through the big ol’ box of potatoes on my counter! 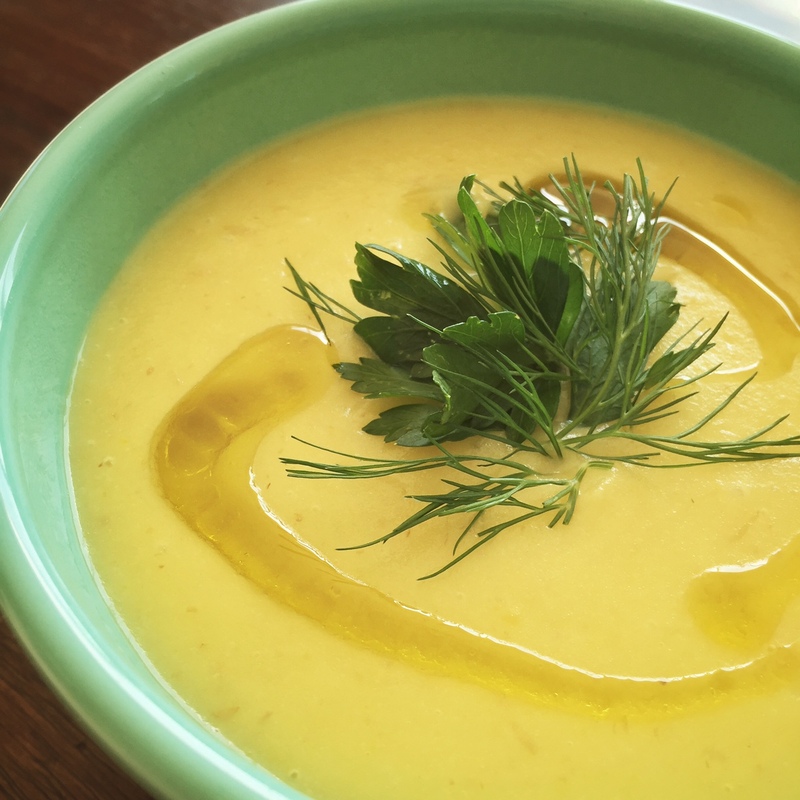 This carrot soup is super tasty and really easy to make. You might be thinking, why is the carrot soup gold instead of orange? I was at the farmers market yesterday and they had the most beautiful white and yellow carrots so I went with those. Feel free to use orange carrots, or any color carrots for that matter 🙂 I hope you enjoy and happy meatless Monday! Heat the olive oil in a large pot and add in the diced onions and a pinch of salt. Saute until the onions get pretty soft. Add in the sliced carrots and saute until they get a little soft. Took about 10 minutes. Next add in the potatoes, toss together and add in 5 cups of water. Bring to a simmer and let simmer for about 30 minute or until the potatoes are fork tender. Working in batches, blend the soup in the blender until smooth. Return to the pot and season more with salt and add more water if you need to thin it out. – Is there other ingredient I can use to replace the potato so the soup has less carbs? Thank you! And if you simply omit the potato the soup will still come out nicely, just a little more thin. The flavor will still be great! Lovely website and great health business you have. I found you through your video of how to make healthy junk food. I have been teaching natural health and vegan cooking schools for over 35 years, and was very happy to see your high quality production. I’ll share it with my students if you don’t mind. While I have been making just about everything on your video for many years, you got me on “coconut bacon.” I immediately thought it was lovely to look at and wanted to try it out. I was intrigued of how it might taste…hmmm…Dried shaved coconut would have the right crispy-chewy texture, and how did you get the smoked “meat” taste??? So I came to your website to find your recipe, and alas I have not been able to find it. Is this something that you make? It would be oh so much better than the chemical laden “bacon” substitutes on the market. Also, what is your policy for sharing recipes from your site? Do you allow it? Of course with full credit to you. Thank you for your response in advance.